You may be tempted to forget about caring for your feet now that they’re covered in socks 24/7 and the season of pedicures is behind you. Make no mistake: foot care during the colder months is pivotal to staying well and enjoying winter to the fullest. That’s why we’ve compiled this list of tips for maintaining healthy feet in the cold. Oh the Weather Outside Is Frightful… No matter the weather, we don’t recommend sitting inside by the fire all winter. In fact, inactivity can slow down your circulation and cause blood to pool in the feet, leading to issues like swollen ankles. However, getting out in the winter does pose some unique threats to foot health. · Inadequate gear. Wearing sandals in the snow isn’t only uncomfortable and a bit silly looking – it puts you at risk for chilblains (inflammatory red patches that may swell up), frostbite, and injury. · Footwear that is too tight or loose. Shoes or socks that are too tight will decrease blood flow to the feet. Loose gear allows for heat loss and wind exposure. · Excess sweat or wetness. 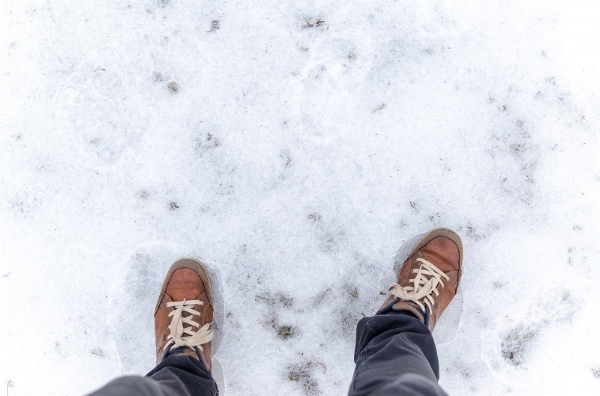 Even proper winter footwear can cause feet to sweat from activity. And the ground is frequently wet from rain, snow, and melting snow and ice during the winter. Leaving feet wet for a long period can cause fungal and bacterial infections. It can also exacerbate skin conditions like eczema and psoriasis. · Falls that lead to foot or ankle injuries. Winter falls could be due to wearing high heels or shoes with poor tread on ice, or just from slipping. They can lead to ankle sprains or broken bones. · You have poor circulation, due to cardiovascular disease, diabetes, or other causes. Foot care is especially important for those with diabetes; about 20 percent of individuals with diabetes suffer from ulcers and infections in the feet that put them in the hospital. · You have nerve damage from diabetic neuropathy or other causes. Note that qualifying diabetics should get their toenails cut by a foot specialist, and others can consider coming to the Medical Nail Spa. · You suffer from Raynaud’s phenomenon, a disorder characterized by decreased blood flow, usually in the toes, fingers, ears, and/or tip of the nose. · You are a smoker or have been drinking alcohol. Nicotine alters circulation and blood flow to the feet, and alcohol dilates blood vessels, increasing heat loss throughout the body. · You have poor nutritional status, which affects your body’s ability to regulate temperature. Issues with nutritional status include dehydration, hypoglycemia (low blood sugar), and low body mass index (BMI). It’s good to be aware of the pitfalls of winter weather, but, again, it’s no reason to avoid the outdoors for the next few months. There’s nothing quite like gliding across the ice on skates, using snowshoes to walk on feet of snow in a quiet forest or flying down a ski hill with the brisk wind in your face. With simple, regular at-home foot care, you can enjoy the colder months to the fullest. These healthy foot maintenance tips are straightforward and will keep you active all winter long. Attending to them will also pay dividends when the snow melts – or when you pack your sandals for an upcoming trip to the beach. · Inspect your feet regularly, paying close attention to color changes, foot temperature, and changes in the toenails, as well as cracks, cuts, peeling, scaling, or any growths. · Wash your feet daily, being sure to wash and dry thoroughly between your toes. · Use a pumice stone or foot scrub to smooth out natural calluses and dry skin, which are often worse in the winter due to dry heat. Be careful not to overdo it as scrubbing too hard or too often may irritate your skin. · Toenails should be trimmed straight across... but not too short! · Clean beneath your toenails. · Note that diabetics should get their toenails cut by a foot specialist. · Moisturize your feet, but not in between the toes. · Give yourself a foot bath with Epsom salts and indulge in a foot mask afterward. Even with the best of intentions and care, foot and ankle conditions and injuries may still occur. If your feet have been exposed to cold and dampness for a prolonged period, avoid hot water or direct heat. Instead soak your feet in warm water, which allows them to return to their normal temperature gradually. We can treat sprains or suspected fractures caused by falls or sports-related injuries. If you believe you may have an injury, contact us right away or visit the emergency room for prompt diagnosis and treatment. Finally, if you notice anything out-of-the-ordinary during your regular foot inspections, give us a call to set up an appointment. We have offices located throughout West Michigan; no matter where you are, we aren’t far. Check back for our next blog post with tips for choosing supportive winter footwear and the following post with skincare tips for your feet.